LA JOLLA—To everything there is a season. This saying applies to many human endeavors, but new research shows it’s even true on the molecular level. A Salk Institute study published in the journal Science on February 8, 2018, found that the activity of nearly 80 percent of genes follows a day/night rhythm in many tissue types and brain regions. 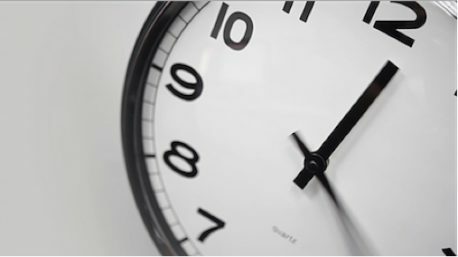 While scientists have long known that many tissues follow these cycles, called circadian rhythms, this is the most comprehensive study connecting timing to gene transcription (the process of copying DNA into RNA to guide protein assembly). 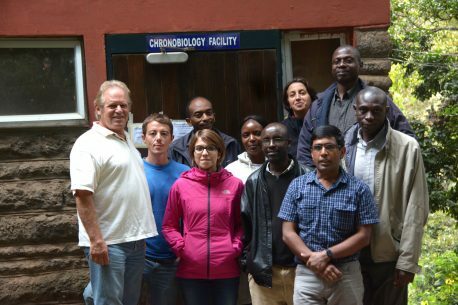 The research team pictured in front of the chronobiology facility established by Howard Cooper, at the Institute of Primate Research in Nairobi, Kenya. Using RNA sequencing, the research team tracked gene expression in dozens of different non-human primate tissues every 2 hours for 24 hours. The team found that each tissue contained genes that were expressed at different levels based on the time of day. However, the number of these “rhythmic” genes varied by tissue type, from around 200 in pineal, mesenteric lymph nodes, bone marrow and other tissues to more than 3,000 in prefrontal cortex, thyroid, gluteal muscle and others. In addition, genes that were expressed most often tended to show more rhythmicity, or variability by time. Of the 25,000 genes in the primate genome, nearly 11,000 were expressed in all tissues. Of those (which mostly govern routine cellular functions, such as DNA repair and energy metabolism), 96.6 percent were particularly rhythmic in at least one tissue, varying drastically by when they were sampled. In most of the tissues, gene transcription peaked in the early morning and late afternoon and quieted in the evening after dinner, around bedtime. With 81.7 percent of protein-coding genes experiencing a rhythmic effect, this timing mechanism is far more widespread than previously suspected. “These findings provide new insights that could influence how scientific research is validated. For example, scientists trying to replicate previous work may pay closer attention to when specific assays were conducted,” says the paper’s co–senior author Howard Cooper, who is a visiting scientist at the Salk Institute. Aside from informing new research methods, this molecular timing mechanism could also impact drug effectiveness. In the future, pharmacists may provide patients more detailed instructions on how often and when to take drugs. The Salk team’s gene expression atlas could also help scientists illuminate how late-night lifestyles impact human health. This could apply to shift workers or anyone who deviates regularly from the day/night cycle. In addition, this work might also advance aging studies, as these rhythms often become disrupted as people grow older. Other authors on the paper were Hiep Le, Giorgia Benegiamo, Max Chang and Luis Rios of Salk; Ngalli Jillani, Ngotha Maini and Thomas Kariuki of the National Museums of Kenya; and Ouria Dkhissi-Benyahha of the University of Lyon and INSERM. The work was supported by a Salk Institute innovation grant, the Department of Defense, the Chapman Foundation and the Helmsley Charitable Trust, the Glenn Center for Aging Research, and the Fyssen and Catharina Foundations.